Let's face it, life isn't easy. It's hard, messy, and complicated. Life knocks you over and kicks you when you're down sometimes. And all of it can make it hard to stay positive, and hold on to the hope that things will get better. Being brave doesn't mean going thrill-seeking or taking huge risks. Being brave can mean just getting up and living your life as fully as possible, despite whatever setbacks you have or may still face. Bravery is not fearlessness. Bravery is doing things despite your fears. So being brave isn't easy either. Taking chances, going after what makes you happy; those can be pretty terrifying sometimes! The fear of failure or rejection can be a huge hurdle to overcome, but you have to keep reminding yourself of why you're doing it in the long-run. You might have no idea what you're doing, or how to do it, and you may fumble and make mistakes, but life is an ongoing learning process. Sitting back and allowing life to pass you by, never going after what you want, will never make you happy. And maybe there's some things in your past that have hurt you and made you nervous and afraid, but bravery is carrying on anyway. 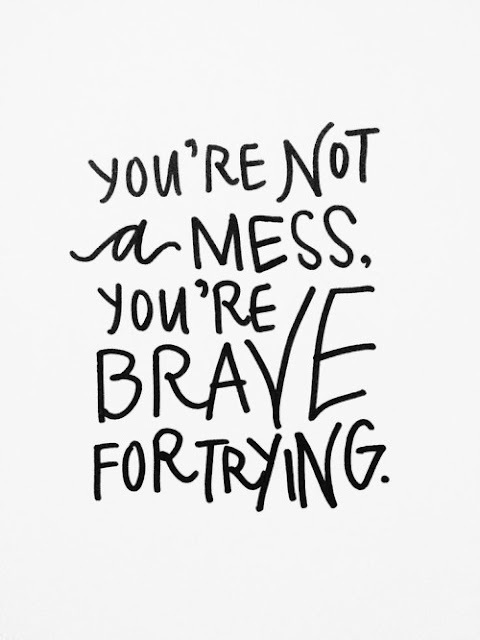 Bravery means giving something a try, even if you are scared. Bravery is showing up and not allowing your past to drag you down and define you. Bravery is being yourself, unapologetically and wholeheartedly. We control our lives. We have the power to make choices to change our lives when they aren't what we want them to be. Yes, of course there are some things out of our control, as I don't think any of us can achieve the absolute perfect lives for ourselves. But we must take control of what we can. We can stand up and fight for what we want, what we need, and not allow ourselves to let opportunities slip away. What good is spending eighty, ninety years on this planet and wasting them away on regret? You get one shot at life, so make it count. And when things seem scary, remember that. Remember that you are alive. You are a unique individual, and no one will live a life like yours. We only get so long in this life, and we should do what we can to make it count. We are these perfectly imperfect, beautifully flawed creatures. We screw up, we make mistakes, we get hurt and broken; but we carry on. We all possess this inner strength and bravery, which helps us to push ourselves out of bed in the morning and go out to face that big, scary world. Life is scary. Being brave is scary. But it can also be so worth it. That doesn't mean you have to be one hundred percent fearless all the time. It's ok to feel scared, to have days where you have to take a step back. As long as you balance those out with the days you do try, the chances you do take, the fears you do overcome. Because that's really what bravery is; not being fearless, but rather facing your fears, embracing them and doing the thing that scares you anyway.